Antiques and collectibles enthusiasts often find themselves frequenting community charity auctions, local antique shows, neighborhood garage sales and internet web sites searching for their next “Great Find.” But buying from someone you don’t know—and may never be able to find again—is sometimes risky business. For collectors of different types of ceramic art, including porcelain figurines, art pottery and clay sculpture, one of the issues facing them is the fact that chipped or broken porcelain can be professionally restored so that the damage is no longer visible. But the pieces may not always be marked as such. 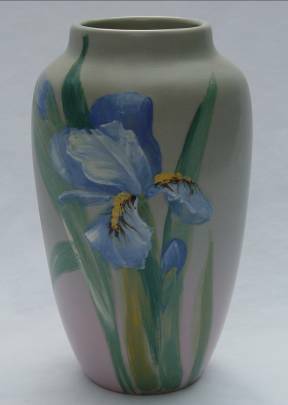 Chips on the top rim of this Weller Art Pottery vase were professionally restored by Old World Restorations, Inc., Cincinnati, Ohio. The repairs are invisible to a cursory glance. Which is why one needs to be on the lookout for repaired porcelain, art pottery and clay pieces. So, how can one know if an item has been damaged and restored? 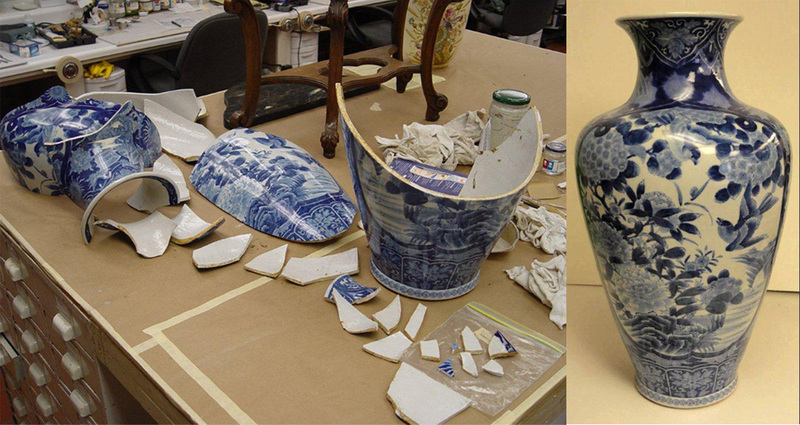 There are different methods and types of equipment used by conservators to detect invisible restoration of ceramic objects. Ultraviolet (UV) light is used to examine the surface of an object and to reveal adhesive residue or any substances that may have been applied over the original surface to mask damage. X-ray can also be used to show fractures that have been invisibly restored. If allowed, a collector can usually have art and antique items inspected by an experienced conservator or museum conservation lab. But if your are standing in the middle of a flea market, holding a piece you might be interested in buying, knowledge and experience are probably the most valuable tools with which collectors can equip themselves when inspecting and buying ceramic art. It is important to learn as much as possible about the objects’ nature and composition and be able to confirm that it has the proper shape, size, design and glaze. Even when buying from reputable auction houses and dealers, one should still have a basic knowledge of the methods and materials that were used to create the object. Don’t be afraid to ask the seller questions like: “How and when did you acquire the object?” “Have you thoroughly examined it for damage and repairs?” and “Are you willing to document the condition in writing and provide a money back guarantee if it differs from your representation?” (Answers to these questions are especially important when buying over the Internet). I recommend a visual inspection of the object in direct sunlight. Look for inconsistencies in the color, decoration and glaze. When a damaged ceramic object is restored, it will usually have some type of clear non-fired coating applied over the repair to mimic the original surface glaze. In some instances, this “simulated glaze” is applied over the entire surface. Unlike original fired glazes, new acrylic coatings often contain lint or dust particles that can be seen with the naked eye under direct sunlight. Some original ceramic glazes exhibit a network of fine cracks know as “crazing.” These small surface cracks should not be restored and are nearly impossible to replicate when completing a restoration in an area of an object that is crazed. If an object has visible crazing, look for inconsistencies or the absence of crazing in suspicious areas that may indicate a restoration. Even a piece that looks to be so damaged it can’t be saved still has a chance at recovery. Carefully run your finger along the edges to reveal any rough spots or chips that may be hard to see. Some vases and flat objects can be lightly tapped with your finger or a straight pin to check for structural cracks. A cracked object will not “ring” like a bell when tapped. I also suggest that you carry a small straight pin with you when shopping for ceramic objects. With the permission of the seller, carefully and lightly “touch” the point of the pin to the surface of the glaze where you suspect a restoration. The pin will easily slide across the glasslike surface of original fired and un-restored glaze; however, it will not slide across, and may even sink into, the simulated materials used to restore the damage. Be careful not to scratch or damage the glaze or the restoration. 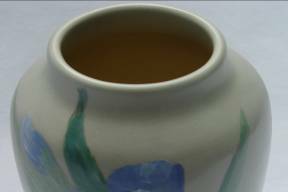 Some claim that a similar test can be done by touching a suspected area of an object to your teeth to reveal a difference between original and restored glazes.